(Jan 7) - R.I.P. Giuseppe " Pino" Daniele (March 1955 - 4 January 2015). Arguably the best-known Italian singer-songwriter in the world, he was taken by a heart attack in Rome the other day at age 59. There is a separate entry on him at this link. 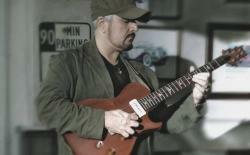 As a writer, guitarist and singer, he leaves a long and impressive discography across a very wide range of genres, from pop, blues and jazz to Middle Eastern music. Some of his songs about Naples, itself, sung in his native Neapolitan dialect have become to younger Neapolitans somewhat of a "genre unto themselves," much in the same sense as the classical "Neapolitan Song" of a century ago was to other generations. He was an exponent and defender of multi-culturalism, and his music reflects that. At the same time, he was the example par exellence of what it means to be Neapolitan. In that, among recent artists, he draws immediate comparison with local film-maker, Massimo Troisi, who died in 1994 at the ridiculous age of 41. They represented the area well, were full of humor, and they were good friends. (Jan 7) Stefano Putignano I point out something you already know —the term renaissance is overused. I merely note that at least in the visual arts, The Renaissance (a French art term from 1830) happened not just in Florence and northern Italy, but also in the South; you indeed hear the terms "southern Renaissance," "Neapolitan R," Sicilian R" and, in the case at hand of sculptor Stefano Putignano, the "Apulian Renaissance". Two points argue for looking a bit more closely at the Renaissance in the South:(1) It was a separate kingdom, one which underwent political changes with the installation of the Aragonese dynasty in 1444 that had little or nothing to do with central and northern Italy, such as the increasing influence of Spanish and Catalan artists in the kingdom of Naples, and (2) the particular position of Apulia (Puglia), Putignano's home region; it has a long Adriatic coastline (shaded in brown, image, left) with major ports. There are bound to be influences from the east. The town of Putignano sits at the top of the heel of the Italian "boot", 15 km in from the Adriatic between the port cities of Bari and Brindisi. Stefano da [from] Putignano was born in c.1470 and died c.1539. There is usually somewhat of a rediscovery of him at Christmas since he is remembered for a series of Christmas manger scenes (called the Presepe or Presepio, in Italian. Separate entry here.) His are colorful and inevitably noteworthy for their exuberant, even whimsical, ornamentation, all hewn into natural stone from the area. He was a light of the Southern Renaissance and was widely imitated and, unfortunately, now widely sought after by art thieves; little provincial churches are not well protected. Very little is known of his life, but he had a long and productive career, leaving his talent on scores of church facades, statues and manger displays throughout Puglia and neighboring Basilicata. The stone Presepe shown here is in the church of Santa Maria del Carmine in the town of Grottaglie. It is dated 1530. (Jan 22) MAV stands for Museo Archeologico Virtuale (Virtual Archaeological Museum). It is the result of collaboration between the town of Ercolano (Herculaneum) and the Province of Naples that created the Integrated Center for the Enhancement of the Herculaneum Excavations. The museum is a few steps away from the archaeological excavations of ancient Herculaneum. From its promotional literature... "It is a center of culture and technology applied to cultural heritage and communication among the most advanced in Italy. Inside is a unique and extraordinary museum: a virtual and interactive tour [with] the excitement of an amazing journey back through time just before the Plinian eruption in 79 AD that destroyed the Roman cities of Pompeii and Herculaneum." There are more than seventy multimedia installations dedicated to the sites of Pompeii, Herculaneum (pictured), Baia, Stabiae [Castellammare] and Capri . At Via IV Novembre #44 in Ercolano. Phone:+39 081 1980 6511. (Jan 22) After years of restoration, the Gothic basements and chambers at the foundations of the San Martino museum have reopened. When they say Gothic, they're not kidding. The pointed arches and rib vaults in the basements, however, are about all that remain of the original Gothic design of this former Carthusian monastery from 1325. (It was, however, built on the site of a earlier Norman fortress from 1170.) The long corridors, the chambers, and the walls hold more than 150 engraved tablets, statues and other artifacts. It may all now be visited on Saturdays and Sundays. Guided tours are available at 11.30 but must be booked in advance (tel. 39 081 229 4568). (Jan 27) I see that the now highly tourist-conscious town of Matera south of Naples has converted many of its famous caves into upscale "spiritual hotels". "Sleeping in our caves is a mystical experience," says one proprietor. "You'll find your spirit and the real essence of life," touts he. And only a few Ibaloi elders in the Philippines know the location of the 80 secret caves where, according to one paper, the people used to "smoke their elders." Dude, relax — here it means "smoke" as in smoked ham, cured by smoke in order to prepare them to be "fire mummies." (Sorry.) Tibetan Buddhism, as well, speaks of four grand universal caves just as good as any desert for meditation. And so on around the world. I offer no judgment on why paleolithic peoples moved into caves in the first place and started ornamenting the walls. I might have thought that caves were just easier-you don't have to build them-and they can be more easily defended from wild animals and Trick-or-Treaters. Nor do I know if the paintings at Altamira or Lascaux are just what they seem to be or if they were dictated by a sense of magic or early religious thinking. (I tried to call Levi-Strauss and ask him, but he was busy sewing blue-jeans and composing waltzes. He'll get back to me.) If "cave churches" interest you, there are many in southern Italy (see this link). The image (right) is of the church of Sotterra di Paola in Calabria. The word, itself, Sotterra, means 'underground'. (Jan 27) - Vesuvius and Bologna? (OK, get the 'baloney' jokes out of your system, here. I'll wait. This here is art!) This is an unusual depiction of Vesuvius, simply because it has nothing to do with Naples. The title is Il Vesuvio delizioso in occasione dell'annual fiera, e festa Popolare della Porchetta [Delicious (or delightful) Vesuvius on the occasion of the annual fair and popular roast pork festival]. It is from 1665; the etching is by Giuseppe Maria Mitelli (Bologna, 1634 - 1718), a prolific and respected engraver of his time. The "delicious" interpretation of the title is certainly Neapolitan and not that unusual; Vesuvius, indeed, had been used in earlier works as a metaphor of the Neapolitan Cuccagna, the Land of Cockayne (see that link - really), the Land of Milk and Honey, the Big Rock Candy Mountain-the Mountain Cornucopia that erupts with food and treats for everyone. It was a typical Neapolitan festival at one time. This image is a bit different. The documentation for this image says, "The engraving shows the scenographic set for the festival celebrated from August 15 to the end of the month in Bologna. A roast pig was thrown to the people to celebrate the liberation of the city from a bloody civil war on August 24, 1281." Since the original of this print is in the museum of the Sforzesco Castle in Milano, who have refused (!) to send me the original so I can read the legend, I'll have to guess. There were two players on the stage in central and northern Italy in 1100s-1300s, the Guelphs and the Ghibellines, engaged in centuries of conflict among central and northern Italian cities in support of either the Pope (Guelphs) and the Holy Roman Emperor (Ghibellines). The conflicts eventually petered out, but for a time they were severe in places; Bologna (a Guelph stronghold) was one such place. The etching shown here has a would-be Vesuvius, but towers, in general, are symbols of Bologna, and the two here, I imagine, represent the two that are most symbolic of the city. The one with battlements (on the right) looks look the Asinelli Tower. The other one (across the street in real life) does not, admittedly, look at all like the Garisenda Tower. But even if they are not specifically the so-called "Two Towers of Bologna" (indeed, they were architect Minoru Yamasaki's inspiration for his Twin Towers at the World Trade Center in New York!) they represent the Guelphs and Ghibellines, in a sort of truce or stand-off, although there are still too many dragons flying around. Yet Vesuvius is erupting, returning prosperity to the people. I'm not exactly sure what happened on August 24, 1284, in Bologna to end the "bloody civil war" (it was likely a truce between Guelphs and Ghibellines within the city). I think the artist, Mitelli, lived too long afterwards to be taking sides here, although he was from Bologna and presumably had ancestors on one side or the other. I really need that legend. 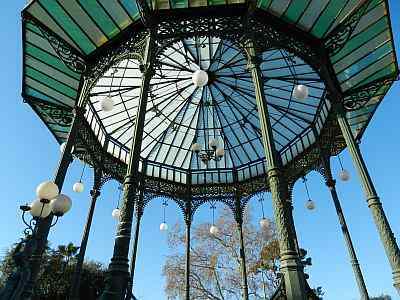 Villa Comunale, the public park in Naples. (Feb. 14) - For the last ten years, FAI (the Italian Environmental Fund) (website here) has conducted a yearly nationwide poll that lets you vote for sites that are worthy of being named a "Luogo del Cuore" (a "place of the heart"), that is, some piece of the natural or man-made landscape that should not be forgotten, but rather nurtured, saved, taken care of and restored, if necessary. The 2014 results have now been counted. There were 1,658,701 votes spread among 20,000 sites. The top 13 places had more than 20,000 votes apiece. At the other end, some places had just a handful, maybe just one or two votes. You could vote for churches, monuments, beaches, archaeological ruins, abandoned factories, school libraries ...pretty much anything. The winner for all of Italy was the Capuchin monastery in Monterosso al Mare in the province of La Spezia (near Genoa). It got 110,000 votes. The Campania region was among the most active in Italy. The 1000-year-old church of Sant'Agnello in Maddaloni (near Caserta) got almost 38,000 votes and was fifth in the national standings. It is currently in sorry shape as are many of the items. Others are not so bad (image, above) but need to be safeguarded. I checked out the lower end of the scale and found some places that I had heard of and some I had not. I looked at the city and province of Naples. I always knew that the Filangieri Museum right in the middle of town needed help — 5,000 votes and in 70th place, nationwide. What this? In the town of Pollena Trocchia at Monte Somma (that's the other cone that sticks up next to Mt. Vesuvius) there is a monument and plaque erected in 1911 to honor composer Gaetano Donizetti. This was his favorite place to sit and write music — 34th place, more than 10,000 votes. I checked the very bottom. Here's a lovely "monument tree" in the town of Cicciano near Nola (not far from Naples) 15 meters tall and estimated to be 1600 years old(!) — 518th place, one lousy vote. Probably the property owner. Or maybe the tree. That's sad. They'll probably chop it down to make ballot boxes for next year's poll. FAI and a corporate sponsor, the Intesa San Paulo bank, say they have "saved" 45 sites, churches, beaches, trees — whatever — since they started doing this ten years ago. (Feb. 24) We don't really need another one of these. 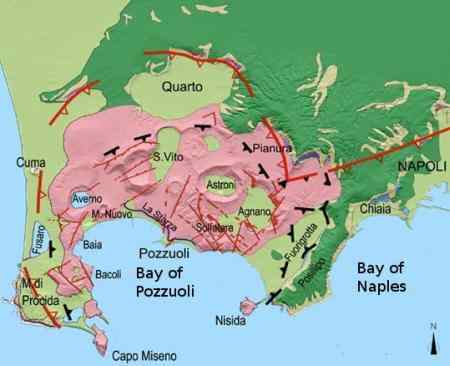 There is an entire portal on this website dedicated to Underground Naples, including entries on cave-ins, landslides, etc. They pose an extreme danger to the city. It has happened again, this time in the western suburb of Pianura, a town in the so-called Camp flegrei (Fiery Fields) mythologically infamous for the fickle and dangerous subsoil. The hole you see here, however, has less to do with fiends of hell than with those of overbuilding and shoddy engineering. It started a few days ago with a subsidence of the road bed. In a few hours that had changed into an opening in the street large enough to entrap a city vehicle engaged in picking up rubbish. It then rained for two days, which transformed that opening in the street into the deadly sinkhole seen here. As of today, 200 families have been evacuated and the local underground train service has been interrupted. Latest from news reports is that the sinkhole is getting bigger. (Mar. 6) - Augustus and Campania: from Octavian to God - an exhibit running through May 4 at the National Archaeological Museum of Naples. The exhibit focuses the close relationship between Augustus Caesar and the Campania region of Italy. It is a multi-media display including over 100 objects from the vast collection in the holdings of the museum, some of which will be seen by the public for the first time (and which, in fact, are awaiting more permanent disposition in the same spaces in the museum as the well-known Farnese collection. There is also a set of "Augustan itineraries" on display dealing with places of extreme interest in the life of the emperor: Nola, Neapolis (Naples), Pausylipon, Baia, Cuma and Pozzuoli. The exhibit is part of activities in Italy to mark the 2000th anniversary of the death of Rome's first emperor. (Mar. 8) - There's a nationwide organization cleverly named co.mo.do. Pronounced like the word comodo, it means "comfortable', but it stands for Confederazione della mobilità dolce — "Confederation of Sweet Mobility." It is dedicated not to the restoration of, but merely to the appreciation of — and to the trekking along the abandoned tracks of — the trains of long ago. There are 5,000 kilometers of such railway lines still in existence in Italy, and about 400 of them are in the Campania region of Italy. Thus, today was the eighth edition of National Day of the Forgotten Railways and throughout the land, a few thousand hardy souls (because it's cold and still snowing in many part of Italy) put on sturdy footwear, dressed warmly and showed up to wander along tracks unused for years, across picturesque bridges and trestles and even stop at some quaint old stations that have been opened for the occasion. In these parts, that meant tramping along the route of the train that ran from Avellino to Rocchetta (actually out of service only since 2005) or, in the Province of Salerno, starting on the coast at Palinuro and looking at parts of the truly historic train line that took you through the Vallo di Diano (now a national park) all the way to Calabria. There's an old train line at Mt. Vesuvius, as well. And so forth. Many of these routes were abandoned for new parallel super-highways or the new high-speed trains. (Mar 13) Today is Friday the 13th! It is not the case that the day is "universally" considered unlucky, not even in all of Western culture. I've just asked 7 Neapolitans, a Pole, and a Ukrainian whether they think today is lucky or unlucky. 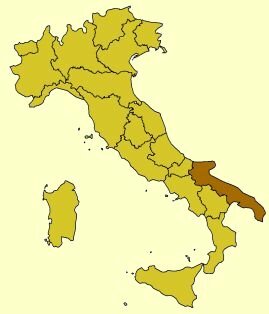 Six Neapolitans said 'lucky' (! ), the other Neapolitan said both (!) — what a weasel. The Pole said "unlucky" and the Ukranian said she wasn't superstitious right before she stepped off the curb into a passing bus. In Italy, today is the day of good luck. Friday the 17th, on the other hand, is unlucky. Friday, possibly because executions in ancient Rome were on a Friday and if you write 17 with Roman numerals as XVII, you can rearrange those letters to spell out VIXI; in Latin that means "I have lived" and is in the past perfect tense/aspect (i.e. it describes a finished action); thus, "I have lived and am done living. My life is over." So, put Friday and 17 together and you have a very unlucky day! In the smorfia, the Neapolitan tradition of interpreting dreams as numbers to bet on in the lottery, the number 17 is associated with disgrazia —that is, an accident or disaster. Thus, in Naples, if you dream of such, bet on 17 as one of your numbers. Of course, if you win a lot of money betting on an unlucky number, you're really lucky. (Mar 14) - Nice habit! Pope Francis will be here in a few days and much of the buzz is focused on his itinerary. In keeping with his reputation as one who cares deeply about the poor and disadvantaged, he is certain to visit the worst places in the city —and those can be pretty bad. Scampia, for example. On the lighter side —I think — he might drive right by a billboard with an advertisement put in place by the Milanese fashion design firm, Rosso di Sera. The company currently has a 30-foot/10 meter-high poster up where the pope might see it. It is the ad that you see here (right), showing a bare-breasted nun. I don't know that anyone knows what the ad is for. Rosso di Sera sells a lot of fashionable "scruff chic" —torn this, threadbare that — like the prewashed, prewrinkled, preripped jeans the model is wearing. (At least I think she's a model. Maybe she's a real nun!) Most people think the ad is potentially offensive. Not so, says Rosso di Sera. No intent to blaspheme, we're good, pious people, too ...etc. etc. It isn't clear if they're going to take the ad down before the Pope drives by. They might as well, since they now have all the publicity they need from the incident, which, of course, is the reason they put the ad up there in the first place —unless, of course, they were just trying to remind you to go to church. (Mar 22) - Well, the pope was here and has gone. He went first to one of the worst sections of Naples,Scampia. Then he went back into town to the giant Piazza del Plebiscito and spoke to 60,000 persons. Then he did a series of something elses for the entire day — went to the cathedral, went to Pompei, had lunch with some ordinary people, etc. etc. 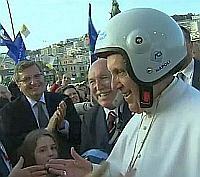 and wound up down at the seaside drive, via Caracciolo, where he donned a motorcycle helmet to promote safe driving. At a certain point he sat down because he was tired. Can't imagine why. know there are many hundreds of such sites in Italy. I'm not making the case that we should try to save or restore them all, but every once in a while you find a small jewel from a thousand years ago — just a tiny reminder — and you say, "Ah, this one is worth it!" Besides, it helps you calm your rage at the latest in daily reports about fanatics who delight in destroying our cultural memory instead of nurturing it. Policastro Bussentino is a small town on the coast of the gulf of Policastro, the southernmost of the three gulfs in the Campania region of Italy. You can pass quickly though that stretch of coast and through the larger towns of Sapri and Maratea and then you're on the long run down the Calabrian coast. Do it. It's a great trip. 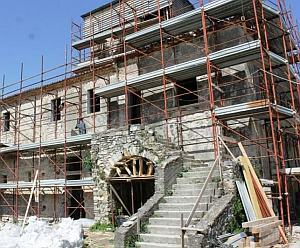 Yet, right above Policastro Bussentino is a hamlet named Santa Marina, where they've just started to restore a tiny church and monastery that looms, if not large, at least interesting in our Western religious traditions. It is the church and monastery of St. Francis of Assisi, lain in ruins for the last 200 years. It was built in the 1200s. They've barely started and have already swept away centuries of dust and grime to reveal a work of incalculable value, a fresco of the visage of St. Francis, himself, a product of the so-called Giotto school. The history of the church has the usual ups and downs of churches on the southern coasts. It was destroyed at least once by Saracen pirates in the 1500s, restored and used until the 1800s and then abandoned. So, why is it interesting? Because Gabrielle da Lecce, the first Franciscan bishop in the history of the Roman Catholic church, stayed here. Tradition says that St. Francis did, as well. The plan is to have a small convention hall, a library and even lodging for visitors. New marine fumaroles have been been discovered in the bay of Pozzuoli; that is, underwater venting of volcanic gasses in the Campi Flegrei super-volcano, the most dangerous volcanic structure in Europe. That was the lead in an article today in il Mattino. It is journalistically honed to scare the bejesus out of you. It is probably overly dramatic. A calmer approach would be to point out that, yes, the Vesuvius Observatory and other facilities that keep tabs on such things have detected a new fumarole in the hydrothermal field of Pisciarelli. That is off-shore in what are now submerged ruins of the ancient Roman Portus Julius. However, such phenomena are a normal part of the behavior of very active hydrothermal systems such as you find in the Campi Flegrei. It also helps—if you really want to scare people—to point out that the area was the center of the mammoth Campanian Ignimbrite explosion of 40,000 years, a caldera collapse (bounded by the red cicle in the image, right) that set the stage for later eruptions that essentially created the Campi Flegrei. The last eruption was in 1538; it gave us Monte Nuovo. Other than that, nothing to worry about—although I did say probably "overly dramatic." Reaching over six million people worldwide – more than 1300 pianos have already been installed in 45 cities across the globe, from New York to London, bearing the simple instruction ‘Play Me, I’m Yours’. Many pianos are personalised and decorated by artists or the local community. By creating a place of exchange, Play Me, I’m Yours invites the public to engage with, activate and take ownership of their urban environment. The initiative in Italy is sponsored by Grandi Stazioni (Great Stations) a company that promotes the idea of making at least the 13 principal large train stations in Italy magnificent once again. I like the idea. The picture here is of one anonymous gentleman playing his own concert version of Let it Be by the Beatles. He was pretty good. (Apr 17) - There has been a recent landslide at Cape Miseno, the tall headland that marks the western end of the gulf of Naples. Mythologically, the cape overlooks the waters where Aeneas' comrade, Misenus, master of the sea-horn—the conch-shell—made "the waves ring" with his music and challenged the sea-god Triton to musical battle. In the Aeneid [trans. by A.S. Kline] we read that "...virtuous Aeneas/heaped up a great mound for his tomb/ with the hero’s own weapons,/ his trumpet and oar, beneath a high mountain/ which is called Misenus now after him, and preserves/his ever-living name throughout the ages." The profile of that Cape has now changed noticeably (image, right), the rubble forming a platform at the base of the cliff. Amazingly, there were no casualties as there almost certainly would have been if this had happened in the summer months. The cape is the site of a prominent lighthouse, as yet unaffected. On the other hand, it is—or was—also the site of a tourist path leading out to that lighthouse. It was a popular path because of the view. That path is now interrupted while authorities size up the situation, waiting to see what the cliff is going to do next. The event was technically unpredictable, in that there were no immediate warning signs, no smaller preliminary slide, but it should not have been totally unexpected since other slides have occurred along the same cliff face in recent times. Indeed, as you travel around the gulf, you notice other examples at less famous places. There are homes along the Posillipo coast and over on Capri, for example, very close to disaster and moving closer as time passes.